Sugar Crime Scene: Is Jury Nullification Legal? At the end of a trial, the prosecution always reminds the jury during their closing argument that the jury "must follow the law" regardless of whether or not they (the jury) like the law, believe in that law or thinks it is a terrible law. 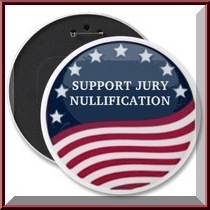 What is Jury Nullification? Is the power to nullify a verdict the same as the right to? Jury Nullification: When a jury returns a verdict of "Not Guilty" despite being convinced that the defendant is guilty of the crime charged. The jury in effect, nullifies a law that it believes is wrong, immoral or has been wrongfully applied to the defendant whose fate they have been charged with deciding. I remember a jury who once acquitted a woman who was charged with murdering her husband. The evidence showed a pattern of years of horrific injuries that she suffered at the hands of her abusive husband, but self defense did not apply because the woman was technically not in fear of her own life at the time she killed her husband. In fact he was passed out drunk at the time she shot him. The photos and medical reports were so bad that the jury did not want to send her to prison for the rest of her life despite what the law required. There is no question that juries clearly have to power to nullify, but do they have the right to nullify? Once a jury returns a verdict of "not guilty", that verdict cannot be disturbed or questioned by anyone and double jeopardy prohibits them from ever being re-tried. A not guilty verdict is the end of the case. So it is easy to see that any jury can exercise their "power" of jury nullification without any recourse. If juries have the "power" to nullify, shouldn't they be told of it? 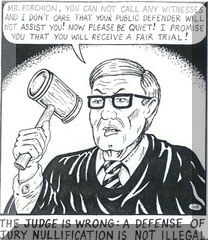 Not only are they not told of it, some court go so far as to tell a jury that they may not exercise jury nullification despite knowing that they can and that nothing can be done to prevent it and they cannot suffer any consequences as a result of it. To read more A to Z entries, click on this link. I think being a member of a jury is a very important part of our legal system, but I've written about two men who had juries that were less than stellar. One man's jury consulted the Bible in deliberation and the other man had a woman on his jury that didn't "understand the big words" and was not a native English speaker. Both men were executed. That's good to know if I ever have to serve jury duty. What a big concept to neglect to inform the jury. I take it this is US law - I'm not sure how it stands in the UK. I've only been called for jury service once - but my kids were pre-schoolers so I was exempt. Wow, I was unaware of this power. I'm not sure if it's the same in Australia. I was called for Jury duty last year, but didn't end up being picked. I would've loved to have seen the process. 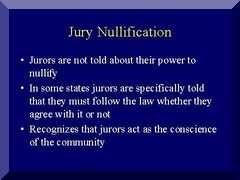 Being a defense lawyer, I, obviously am in favor of jury nullification. 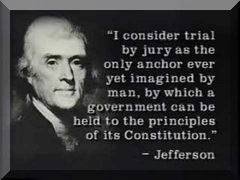 If I think I'll have to make a jury nullification argument I lay the ground work during the jury selection process unless I'm in federal court where the judge asks all the questions. I have to be careful what I say during jury selection or voir dire because in Louisiana where I live you are not allowed to tell them jury nullification exists. Here is what I do. I will tell them that the prosecutor is correct when he says you must follow the law even if you don't agree with it. I then tell them that they are the sole judge of the facts, not the lawyers or even the judge because the judge is prevented by law from commenting on the evidence. I then emphasize that once the judge reads the law to them they then become the judge of both the law and evidence and they take the law as they understand it and apply it to the facts as they found them to reach a verdict. In my closing argument I remind them of what i said in jury selection and tell them to use their common sence and that there is no way the legislature intended for that law to mean what the prosecutor says it means. That is the method I think a jury nullification argument can be made in a state which does not permit jurors to even her the term jury nullification. Melissa, I love your blog and read it all the time..I usually don't leave any coments but I find your blog to be very well written and most informative. I love you. You are so sweet. I had no idea you ever read my blog. I feel so special. Wow. 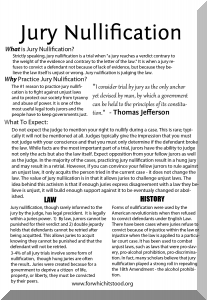 Jury nullification. You're brave for putting this on your blog. I've served on juries a number of times, and when I'm asked to raise my right hand and swear that I'll follow all instructions, I mouth the words "Yes" or "I do" without really saying them. Why? Because I know that the judge will probably tell us we cannot nullify the laws. I don't have the documentation for this, but I have read that in the pre-Civil War days, juries constantly nullfied the laws and refused to return escaped slaves to their masters. They judged the law to be unjust. This is not as radical as it sounds. I have never tried to nullify a law. On the other hand, I've been on a jury where a woman said she wanted "social justice," and she wanted to rule against what she perceived to be a rich Republican and in favor of a supposedly poor Democrat, not because she thought the law was unjust, but just because she wanted to rip off the Republican (the juror did not succeed). On another jury, an old codger wanted to vote not guilty on what was obviously a drunk driver, just because the police officer who was testifying to the drunkenness reminded him of a different police officer long ago that he didn't like (the old codger finally gave in). In other words, incompetent jurors disregard the law for their own personal, unjust reasons. Potential jurors who think carefully about jury nullification are trying to pursue justice.